Welcome to my stop on the February New Release Giveaway Hop! As always, it is being hosted by the magnificent O'Dell at Book Twirps and the glorious Dani at Refracted Light Reviews. They exude awesomeness to an extent that I am sure is contagious. Since you know your likes and dislikes best, I'm letting your choose which book you win (only one, sorry), granted that it's less than $15US. The above collage is just some suggestions. If there is an adult or children's book that you would prefer, you are more than welcome to that. If this is your first visit to Bibliophilia, Please, then you're going to be terribly disappointed to discover that there are no hoops to jump through, and my giveaways are INTERNATIONAL (as long as Fishpond or Book Depository offers free shipping to your domicile) unless otherwise noted. (There is nothing to note here - keep reading.) Following and/or spreading the word is always appreciated, but not required on the playground today. Today, all you have to do is be you and click a ridiculously large, green button on the Rafflecopter form. You are, however, being given an extra opportunity to enter since the running time for this giveaway is shorter than usual, and I feel extra generous in my birthday month. Thank you again, and again for an easy and awesome giveaway!! Great Question! I'm sure it will be nice to see where everyone comes from. Oh snap those are definitely some good ones to choose from! 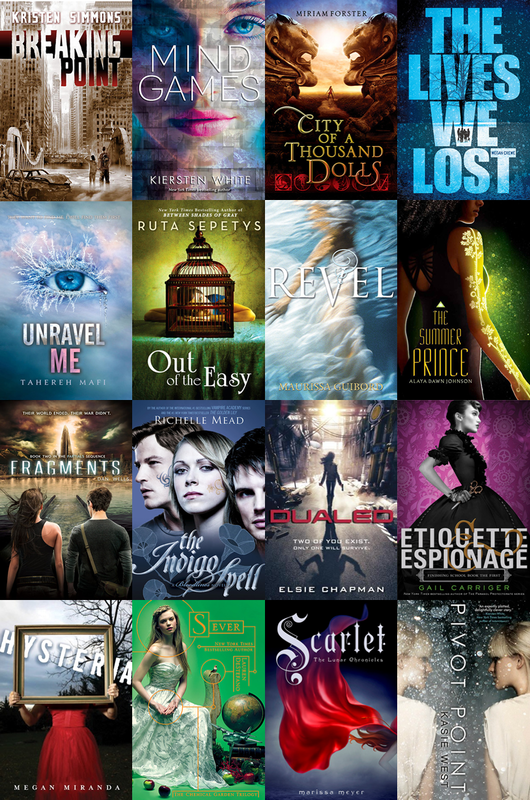 I would love Breaking Point by Kristen Simmons or Fragments by Dan Wells.